Saba Rizvi comes from a conservative family in Lucknow, UP. Neither Saba, nor anyone in her family knew about the facilities and the opportunities available for the blind to study, so she never went to school and had always thought that blind people like her could only be home-bound throughout their lives. Then after 34 years, she almost instantly got addicted to the then new radio show Eyeway – Yeh Hai Roshni Ka Karawan (Caravan of Light). Listening to the show each week, she found herself aspiring to accomplish things in her life just like the inspiring lives of blind people interviewed on the radio, including Sudha Patel, the first blind lady sarpanch (elected head) of her village, and Nafisa Buhariwalla, a banker. Recently, Saba learned to read Braille and has been enrolled for home study. She is now getting ready to appear for class 10 exams. Anjina Bhat of Noida in UP is mother to Arush, a 3-year-old boy who is nearly blind because of retinal degeneration. Anjina has considered Score Foundation a valuable knowledge and motivational resource in bringing up her son. The parenting section of the Eyeway Website www.eyeway.org for instance, provides her information in developing Arush’s skills to become independent. Score Foundation significantly facilitated Arush’s inclusion in a mainstream playschool by suggesting multi-sensory activities which both Arush and the other children enjoy. Score continued to help Anjina by getting Arush admitted to the Delhi Public School where he continues to get mainstream education today. Mayank Sharma started to lose his eyesight when he was in class 3 in a regular school in Delhi. Mayank’s teachers were not experienced at handling students with disability and advised his parents to transfer their son to a school for the blind. Despondent over the school’s approach to their son’s situation, the Sharmas approached George Abraham, the CEO of Score Foundation, for guidance on how to handle their son’s lose of sight. George not only provided them with guidance but approached Mayank’s school as well. He helped make the administration and teachers aware about blindness, notably in providing inclusive education to vision impaired students. Amit Patel knew compensating facilities are available for blind students like to give him an equal footing with other students. His university allowed a scribe to write his MBA exams, but not extra time to take the exam. Then he sought the help of Eyeway. Eyeway helped Amit to acquire a copy of the rules for MBA courses, which was the basis of Amit’s request for compensating facilities. 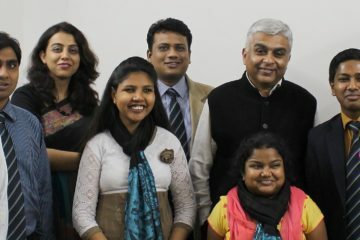 In addition to the information given to Amit, Eyeway also connected him with the Office of the Chief Commissioner of People with Disabilities (CCPD) and his university for a discussion about the matter. After his university was enlightened, Amit was granted his request both for a scribe and extra time in his examinations.